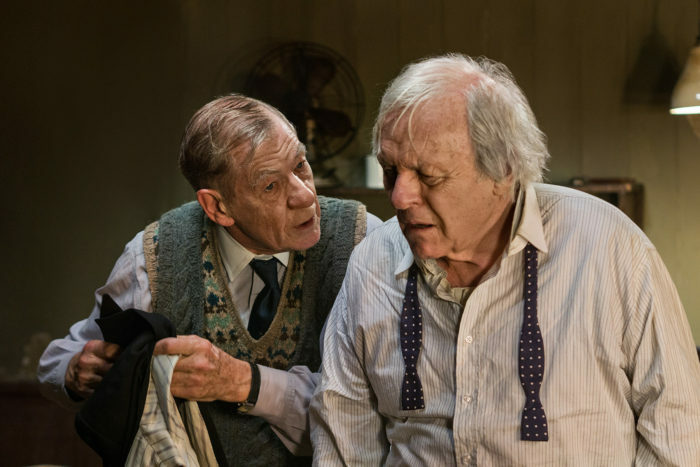 Production Starts On Starz & BBC Co-Production 'The Dresser' - Are You Screening? Ian McKellan and Anthony Hopkins have a new effort for Starz and BBC, and The Dresser is now in production. The made-for-television film based on the famous play is loaded with stars, and is going to be one of the most interesting efforts to come along in quite some time. At least, if the cast itself can be taken as grounds for extremely high hopes. McKellan and Hopkins are perfect for the roles, and the story has proven itself, not only as a great story, but one that holds up over time. Get all the details below, and make sure you watch out for this one. Starz, in partnership with the BBC, today announced that production has officially begun on the movie for television “The Dresser,” an adaptation of Ronald Harwood’s play, to be directed by Richard Eyre (Notes on a Scandal, Iris). The production will film in and around London. “The Dresser” brings together Anthony Hopkins and Ian McKellen working together on film for the first time. Both men were acclaimed for their own stage roles as Shakespeare’s great tormented king: Hopkins at The National Theatre under the direction of David Hare in 1986 and Ian McKellen in Trevor Nunn’s production for the RSC in 2007. The television film is directed by Richard Eyre who directed an award winning production of the play with Ian Holm for the National Theatre in 1997. “The Dresser” tells the story of one fateful night in a small regional theatre during World War II as a troupe of touring actors stage a production of Shakespeare’s King Lear. Bombs are falling, sirens are wailing, the curtain is up in an hour but the actor/manager “Sir” who is playing Lear is nowhere to be seen. His dresser “Norman” must scramble to keep the production alive but will Sir turn up in time and if he does will he be able to perform that night? The play is one of the great portraits of life in the theatre and was first adapted for the screen by Harwood himself 32 years ago, in the 1983 Peter Yates film starring Albert Finney and Tom Courtenay. The current production reverts to Ronald Harwood’s original text and presents the play as it was written for the stage. “The Dresser” is produced by Colin Callender of Playground Entertainment with Sonia Friedman for Sonia Friedman Productions. Polly Hill, BBC Head of Independent Drama and Ben Stephenson, Controller BBC Drama Commissioning are executive producers.